‘Watch Levels‘, both bullish and bearish, are included on several of our publications, including the Morning Report and Index Focus. These are intended to be just that – levels to watch for a potential breakout or breakdown which could result in a change of trend. 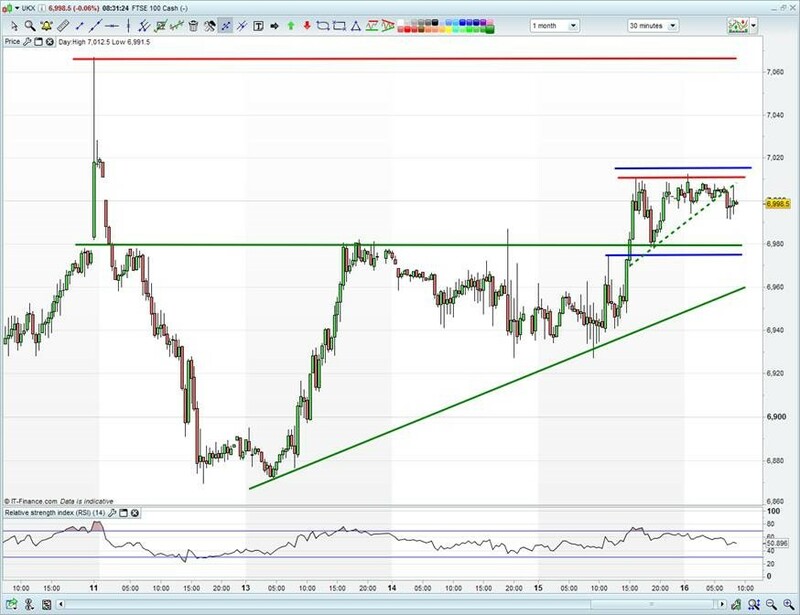 For example, the levels highlighted on the below Morning Report FTSE 100 chart were Bullish 7015 and Bearish 6975. Therefore, we would consider a break above the overnight highs of 7010 or below overnight lows and resistance-turned-support at 6980 (the blue lines drawn on the chart) as having the potential to change the current situation. Watch levels are intentionally placed outside of the current support and resistance levels as indicators that that the current market sentiment may about to be reversed. Whilst by no means does the reaching of one of these levels guarantee that a reversal of the current trend is certain, they do provide situations where investors might want to keep a keener eye on markets as sentiment potentially reaches a turning point. It is not unheard of for both levels to be tested on the same day (known as fake-outs or fake-downs), only for the index to remain within the same trading channel by the market close. In other situations, however, a breakdown or breakout of the watch level can result in a sharp slide/rally that marks a trend continuation or reversal. As a result, watch levels should be used alongside other indicators as part of a wider trading strategy in order for investors to obtain the best possible results.